It is often assumed that life originated and diversified in the oceans prior to colonizing the land. However, environmental constraints in chemical evolution models point towards critical steps leading to the origin of life as having occurred in subaerial settings. The earliest fossil record does not include finds from terrestrial deposits, so much of our understanding about the presence of a terrestrial microbial cover prior to the Proterozoic is based on inference and geochemical proxies that indicate biospheric carbon cycling during the Archaean. Our assessment is that by 2.7 Ga, microbial ecosystems in terrestrial settings were driven by oxygen‐generating, photosynthetic cyanobacteria. Studies of modern organisms indicate that both the origin and primary diversification of the eukaryotes could have occurred in terrestrial settings, shortly after 2.0 Ga, but there is no direct fossil evidence of terrestrial eukaryotes until about 1.1 Ga. At this time, it appears that the diversity of life in non‐marine habitats exceeded that found in marine settings where sulphidic seas may have impaired eukaryotic physiology and retarded evolution. Geochemical proxies indicate the establishment of an extensive soil‐forming microbial cover by 850 Ma, and it is possible that a rise in atmospheric oxygen at this time was due to the evolutionary expansion of green algae into terrestrial habitats. 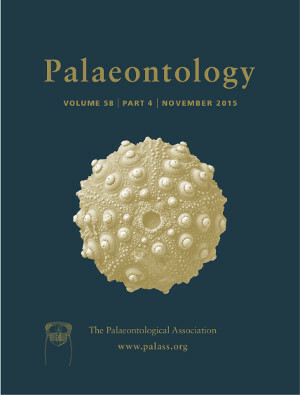 Direct fossil evidence of the earliest terrestrial biotas in the Phanerozoic consists of problematical palynomorphs from the Cambro‐Ordovician of Laurentia. These indicate that the evolution of the first land plants (embryophytes) during the Middle Ordovician took place within a landscape that included aeroterrestrial algae which were actively adapting to selection in subaerial settings.